D-Log: Tala Misses Them Two! 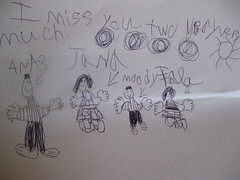 Tala misses Anas and Jana a lot, expressing that in notes and paintings. She has a bunch of them taped to the wall in her room and I find them everywhere in the house. I wish they two know how much she loves them! I started chemo yesterday. I go to the clinic, receive it through the IV in the mediport and come back home. So far, it's the nausea that's bothering me. Well, it's only 2 days now. We plan to take the kids one of those days so they would see it's not a painful thing to have. Tala has been repeating, "I'm sad my Mom has cancer." Baba has been talking about going back to Libya soon, after Eid. I wanted them to stay till at least mid January. Finally, I reached a compromise with him that they will not leave before the 22nd. This way they will see the Nut Cracker with us, the Holiday Party at school, and the Rigney's Christmas Caroling. In the conversation my father said that he just now sees the kids as grandchildren. He said, "I didn't have that connection with them in the beginning." I was thinking about that myself. 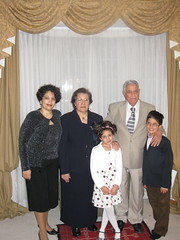 Just like we needed to build that family tie with Anas and Jana, my parents and Mody and Tala needed the time to build and acknowledge their tie. It's a blessing that they have. We have more memories now. We have had so much rich memories this year than any other time. I am thankful for that! A Hole in The Family!